Posted here is the settlement agreement between Walmart, the American Council of the Blind, the American Foundation for the Blind, and the California Council of the Blind. The agreement is the first in the country in which a national pharmacy retailer has agreed to providing talking prescription containers to pharmacy customers with visual impairments. Walmart worked on this initiative in Structured Negotiations with the three organizations, who were represented by the Law Office of Lainey Feingold and Linda Dardarian of the Oakland, California civil rights firm Goldstein, Borgen, Dardarian & Ho. ACB, a non-profit corporation that provides advocacy services in the United States on behalf of individuals who are blind or have visual impairments, is dedicated to promoting the full integration of persons who are blind or have visual impairments into all aspects of society, and provides information to the general public about the accomplishments, needs and contributions of persons who are blind or visually-impaired. CCB is ACB’s California affiliate serving the needs of blind and visually-impaired persons throughout the State of California. Among ACB’s and CCB’s board, staff and members, and those on whose behalf they advocate and provide services, are many individuals with vision disabilities within the meaning of state and federal law who have shopped and continue to shop at Wal-Mart Stores throughout the United States. ACB is incorporated and has its place of business in Arlington, Virginia. CCB is incorporated and has its place of business in the State of California. Wal-Mart operates Wal-Mart Pharmacies in its Wal-Mart Stores. Wal-Mart also operates a Mail Order Pharmacy providing prescriptions through the mail in all 50 states in the United States and Puerto Rico. Claimants contend that they and their respective boards, staff, members and other blind and visually-impaired persons, have been, are being, and continue to be denied full access to the services provided by retail pharmacies and are therefore being discriminated against due to alleged inaccessibility of certain Prescription Information (defined in Section 1.10 below) provided by retail pharmacies throughout the United States, including in Wal-Mart Stores and through Wal-Mart Mail Order Pharmacy (the “Claim(s)”). Wal-Mart denies that it discriminates against blind and visually-impaired persons, including Claimants and their respective boards, staff and members in any way and specifically denies the contentions being asserted by Claimants and specifically denies or that it discriminates against such blind and visually-impaired persons due to alleged inaccessibility of certain Prescription Information that Wal-Mart provides in Wal-Mart Stores and through Wal-Mart’s Mail Order Pharmacy. Wal-Mart contends that it does not and will not tolerate discrimination of its customers on the basis of disability, and that it values its disabled customers and treats them with the utmost respect. The Parties became aware that the ScripTalk Reader (as defined below) is currently being offered free of charge by the ScripTalk manufacturer. This was material to the Parties’ agreement to use ScripTalk as part of the Pilot Program set forth in this Agreement. The Parties enter into the Full Pilot Agreement in order to resolve the Claims during the term of the Agreement and to avoid the burden, expense, and risk of potential litigation. In entering into the Full Pilot Agreement, Wal-Mart does not admit, and specifically denies, that it has violated or failed to comply with any provisions of the Americans with Disabilities Act of 1990, 42 U.S.C. § 12101, and the Title III implementing regulations, 28 C.F.R., Part 36, and any applicable laws of any state relating to accessibility for persons with disabilities to public accommodations, any regulations or guidelines promulgated pursuant to those statutes, or any other applicable laws, regulations, or legal requirements. Neither the Full Pilot Agreement, nor any of its terms or provisions, nor any of the negotiations connected with it, shall be construed as an admission or concession by Wal-Mart of any such violation or failure to comply with any applicable law. The Full Pilot Agreement and its terms and provisions shall not be offered or received as evidence for any purpose whatsoever against Wal-Mart in any action or proceeding, other than a proceeding to enforce the terms of the Full Pilot Agreement. The Claimants acknowledge their appreciation of Wal-Mart’s leadership in providing a pilot of accessible Prescription Information, as provided herein. Access Laws means the Americans with Disabilities Act (as defined below) and any applicable laws of any state, county or municipality relating to accessibility for persons with disabilities to places of public accommodation, any regulations or guidelines promulgated pursuant to those statutes, or any other applicable disability laws, regulations, or legal requirements, including, without limitation, California Civil Code §§ 51 et seq. and 54 et seq., California Health & Safety § 19955, and Title 24 of the California Code of Regulations. Accessible Prescription Information Pilot Program means the ScripTalk Pilot as described in this Agreement. Claims has the meaning set forth in Recital E above. Counsel means Goldstein, Borgen, Dardarian & Ho, The Law Office of Lainey Feingold, and the attorneys practicing law therein. Effective Date means the date Wal-Mart signs the Agreement. Patient Information Sheet means pages of paper that are attached to, or included with, the prescription container when the prescription container is provided to the customer, and contain more detailed instructions and warnings with respect to the prescription medications. As of the Effective Date, the content and format of the Patient Information Sheet(s) provided by Wal-Mart Pharmacies is controlled by a third party not owned or operated by Wal-Mart. Person with a Visual Impairment means any person who has a physical or mental impairment that substantially limits him or her in the major life activity of seeing. Wal-Mart Pilot In-Store Pharmacies means those Wal-Mart In-Store Pharmacies described in Section 3.3 and any other Wal-Mart In-Store Pharmacy at which the Parties agree that the ScripTalk Product will be provided during the Term of the Agreement. Prescription Information means (i) the Prescription Label, (ii) the Prescription Warning Label, and (iii) the Patient Information Sheet provided by Wal-Mart to Wal-Mart customers. 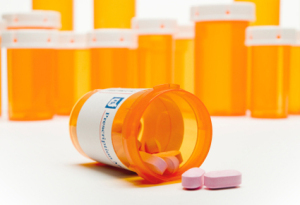 Prescription Label means the label containing patient and prescription use information that is printed out by Wal-Mart and affixed to the prescription bottle. Prescription Warning Label means any additional information beyond what is contained on the Prescription Label regarding the safe use of prescriptions that is affixed by Wal-Mart to the prescription bottle. ScripTalk Product, or ScripTalk means a product manufactured by Envision America that consists of a reader (“ScripTalk Reader”) and a compatible label that can be read by the ScripTalk Reader (“ScripTalk Compatible Label”). As of the Effective Date, ScripTalk audibly delivers the following Prescription Information: (i) name of customer, (ii) name of medication, (iii) dosage instructions, (iv) warning label information, (v) medication expiration date, (vi) pharmacy name (Wal-Mart) and phone number, (vii) prescribing doctor name and phone number, and (viii) refill information and prescription number. Wal-Mart In-Store Pharmacy means a pharmacy located within a Wal-Mart Store. Wal-Mart Mail Order Pharmacies means Wal-Mart pharmacies that deliver prescriptions primarily via mail order. Wal-Mart Pharmacies means Wal-Mart In-Store Pharmacies and Wal-Mart Mail Order Pharmacies, collectively. The Full Pilot Agreement shall remain in effect from the Effective Date until December 31, 2013. The only obligations of either party that survive beyond December 31, 2013, unless a further agreement is negotiated, are contained in the Confidential Addendum. Provision of ScripTalk Labels to Wal-Mart Pharmacy Customers: Beginning June 1, 2012, and continuing throughout the term of the Full Pilot Agreement, Wal-Mart will provide the ScripTalk Labels free of charge with each prescription medication purchased at the Wal-Mart Pilot In-store Pharmacies and Wal-Mart Mail Order Pharmacies by Persons with Visual Impairments, when a request for such ScripTalk Compatible Label is made by the Person with Visual Impairments. Wal-Mart will have no obligation to provide ScripTalk Readers to Persons with Visual Impairments or any other individuals. If, during the Term of the Agreement, Envision America ceases providing ScripTalk Readers free of charge to Persons with Visual Impairments, or if other technology becomes available or other circumstances arise that make such discussions advisable, the Parties will discuss the impact of this change on the ScripTalk Pilot. Duration of the ScripTalk Pilot: The ScripTalk Pilot will remain in effect throughout the Term of the Agreement, unless the Parties otherwise mutually agree in writing. Wal-Mart Pilot In-Store Pharmacies: As of the Effective Date, Wal-Mart is providing ScripTalk Compatible Labels at the Wal-Mart Pilot In-Store Pharmacies listed in Exhibit A attached hereto, and through the Wal-Mart Mail Order Pharmacy to customers who are Persons with Visual Impairments. Throughout the Term of this Agreement, Wal-Mart may, at its sole discretion, expand the number of Wal-Mart Pilot In-Store Pharmacies. The store numbers and locations of such additional Wal-Mart Pilot In-Store Pharmacies will be memorialized in writing. Prior to the expiration of this Agreement, the Parties shall begin negotiating in good faith regarding extending this Agreement beyond the Expiration Date and potentially making the ScripTalk Pilot a permanent part of Wal-Mart pharmacy services. The Parties will also continue their negotiations regarding the provision of Patient Information Sheet information in alternative formats for Persons with Visual Impairments. If the Parties have not reached agreement on any of these issues by December 15, 2013 (or any extension of that date that the Parties may agree to), this Agreement shall expire on December 31, 2013. Response: Within forty-five (45) days of receipt of a Notice provided pursuant to Section 5.1, the non-initiating party shall respond to the initiating party in writing. If the non-initiating party does not respond, it will be deemed that the party has denied the allegations in the Notice of Non-Compliance. Meet and Confer: Within two weeks after the response described above, or at another mutually agreed upon time, the Parties shall informally meet and confer and attempt to resolve the issues raised in the Notice. No modification of the Full Pilot Agreement shall be effective unless in writing and signed by authorized representatives of all Parties. Each party to the Full Pilot Agreement warrants that he, she or it is acting upon his, her or its independent judgment and upon the advice of his, her or its own counsel and not in reliance upon any warranty or representation, express or implied, of any nature or kind by any other party, other than the warranties and representations expressly made in the Full Pilot Agreement. 9. Full Pilot Agreement Has Been Read. The Full Pilot Agreement has been carefully read by each of the Parties, or their responsible officers, and its contents are known and understood by each of the Parties. The Full Agreement is signed freely by each party executing it. No party to the Full Pilot Agreement has heretofore assigned, transferred or granted, or purported to assign, transfer or grant, any of the claims, demands, or cause or causes of action disposed of by the Full Pilot Agreement. The Full Pilot Agreement shall bind any assigns and successors of the Parties. Counsel shall be notified in writing within thirty (30) days of the existence, name, address and telephone number of any assigns or successors of Wal-Mart. The performance of Wal-Mart under this Settlement Agreement shall be excused during the period and to the extent that such performance is rendered impossible, impracticable or unduly burdensome due to acts of God, strikes or lockouts, unavailability of parts, equipment or materials through normal supply sources. If Wal-Mart seeks to invoke this Section, it shall notify Counsel in writing as soon as reasonably possible, specifying the particular action that could not be performed and the specific reason for the non-performance. Counsel and Wal-Mart will thereafter meet and confer regarding an alternative schedule for completion of the action that could not be performed, or an alternative action. Any dispute regarding the applicability of this Section, or any future action to be taken, that remains after the meet and confer session will be handled as a dispute pursuant to Section 6 of this Settlement Agreement. In entering into the Full Pilot Agreement, Wal-Mart does not admit, and specifically denies, that it has violated or failed to comply with any Access Laws. The persons executing the Full Pilot Agreement each represent and warrant that he or she has the authority to enter into the Full Agreement, and to resolve the matters set forth in the Full Pilot Agreement, on behalf of the Party for whom he or she is executing the Full Pilot Agreement, and that no further approval is necessary in order for the Full Pilot Agreement to be binding on the Party for whom he or she is executing. The Full Pilot Agreement constitutes the entire agreement relating to the subject matters addressed therein. Each party and its legal counsel have reviewed and participated in the drafting of the Full Pilot Agreement. Any rule of construction to the effect that ambiguities are construed against the drafting party shall not apply in the interpretation or construction of the Full Pilot Agreement. Section titles used herein are intended for reference purposes only and are not to be construed as part of the Full Pilot Agreement. The Recitals are integral to the construction and interpretation of the Full Pilot Agreement and are therefore incorporated into the Full Pilot Agreement in their entirety. This post contains is a legal agreement between Walmart and groups representing blind people. Walmart will provide talking pill bottles to blind customers ordering prescriptions through Walmart mail order. Walmart is also offering the talking prescription labels at some Walmart stores. To learn more, contact Walmart at 1-888-227-3403.